Well it is officially the start of training camp for the NFL which means that football season Is just around the corner. While teams like the Steelers, Patriots, Giants, Colts, and Ravens are sure to have winning records. I would like to give you the teams to look out for this season, Mad’Nuff’s sleeper picks. Houston Texans: The Texans have been competitive for the last two years in one of the toughest divisions in the NFL. Playing the likes of the Colts, and the Titans twice each year and usually these two teams would be too much for the Texans to handle but this year is different. The Texans are going to finally have some continuity this year, and a decent amount of experience on both sides of the ball. While the Titans have no shot at performing the way they did last year and the Colts abilities have yet to be seen with the changing of coaches. Look for the Texans to make the playoffs this year and possibly even win their division. Minnesota Vikings: There had been a lot of talk about Favre coming to this team but the truth of the matter is he won’t and he is not needed. If Childress does the right thing and Starts Tavaris Jackson look for the Vikings to win their division and steamroll into the playoffs. This is a 9 win team without a quarterback, and if any QB plays well for them this year they are a lock for 11 wins. San Francisco 49ers: Yeah Ok maybe they aren’t a lock for the super bowl, but this is a team on the rise in the worst division in the league, the Cardinals made it to the super bowl last year but that easily could have been any one of the teams in that division. 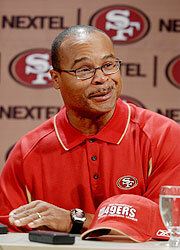 With Mike Singletary at the helm the team made leaps and bounds last year. A team with this much potential only needs to harness it and they could easily win their division. Look for the 49ers to have their first winning season in a long time and be in playoff contention.